• PLOT SUMMARY: At last - the Mistress of Magic in her own ongoing series! 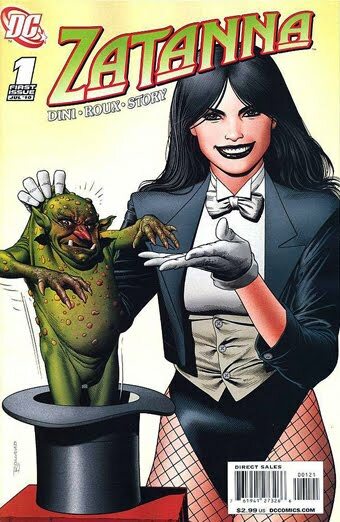 Zatanna Zatara has long made her home in San Francisco, but right under her nose a sinister threat has developed - a crime boss who dominates the criminal underworld with the dark powers of the magical underworld! The terrifying Brother Night is making his play for San Fran, and the police force - including hunky detective Dale Colton - turn to Zee for help. But Brother Night is a whole new kind of criminal and if Zatanna thinks she can backwards-talk him down, then she's in over her top-hatted head! Superstar writer Paul Dini (BATMAN: MAD LOVE) is paired with the gorgeous art of Stephane Roux (BIRDS OF PREY), making his anticipated DC debut on interior art! There's only one thing to say - T'NOD SSIM TI!